Welcome to Melon de Bourgogne.com! This website is the place for information about wines from the Melon de Bourgogne (AKA Muscadet) winegrape in America. Although very popular in Europe, this wine is almost unknown in the US. We hope this website will help change this. 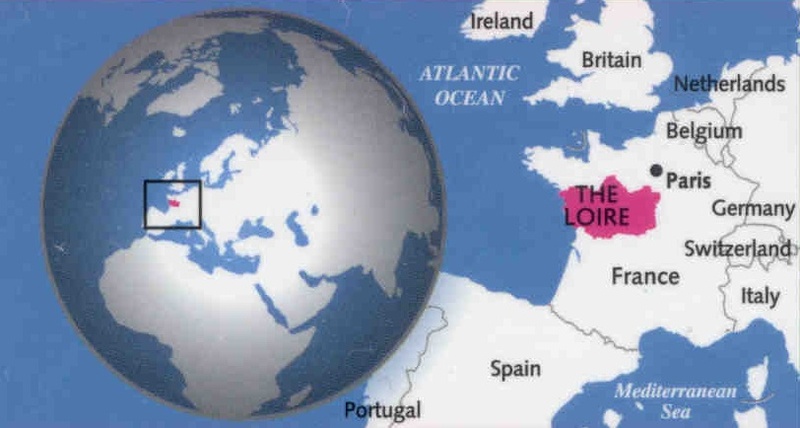 The Melon de Bourgogne winegrape is grown in France near the Atlantic Ocean end of the Loire valley, near the city of Nantes. It originated in Burgundy (Bourgogne is the French name for Burgundy.) The wines from this grape in this region are called "Muscadet". Muscadet should not be confused with the various "Muscat"s which are a different winegrape, or "Muscatel" (which in America is simply a generic name for any sweet wine made from Muscat grapes, but is more famous for being a fortified Muscat wine from Portugal), or "Muscadine" which is an entirely different family of grape (Muscadinia Rotundifolia; most wines are made from Vitis Vinifera). 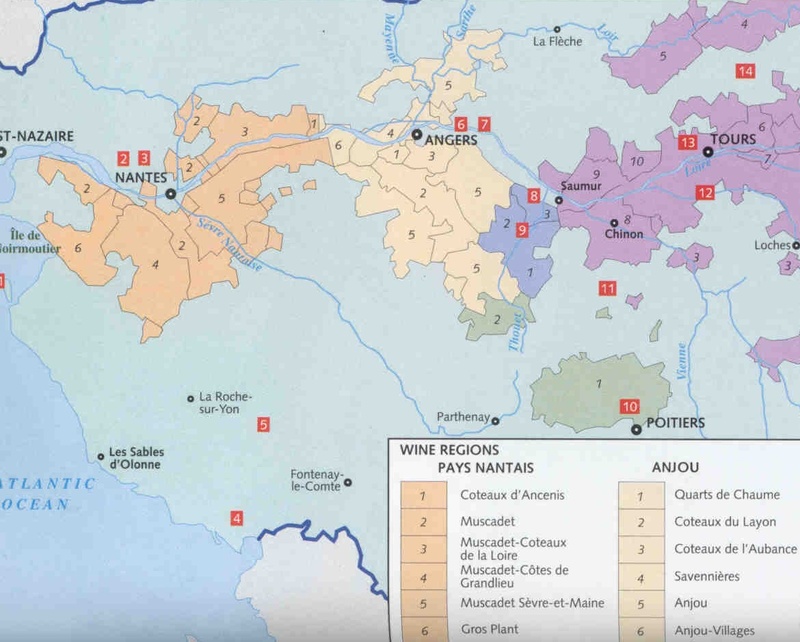 The Muscadet region produces about 5 million cases of this wine annually (2). When visiting Paris, I've found that there's Muscadet displayed in most every wine shop window, and on most restaurant wine lists. This is also true in Britain -- Muscadet wines are commonplace (3). Yet it's virtually unknown in America... Some wine specialty shops will carry it, and an occasional fine restaurant, but that's about it. Melon de Bourgogne was brought to America in 1939 by Georges de Latour. For many years the wines were labeled, incorrectly as Pinot Blanc, which is an entirely different winegrape (4). Several California producers have produced a labeled Melon de Bourgogne wine in the past, including Merlion and Beaulieu Vineyards, though I know of none at this writing. A few California wineries are reputed to produce wines from this grape, though labeled as Pinot Blanc (5). There are but three examples of this wine from American producers that are actually labeled as Melon de Bourgogne, all from Oregon. Washington State has one significant planting, although the vineyard is not yet mature enough to produce commercial quantities of wine.